We all long for peace, love and happiness. And of course we want to be successful in the world. But how can we enjoy these qualities and manifest true abundance amid the often stressful realities of our everyday lives? Fortunately the solution is simple. When you break out of identification with your mind you become free to create your life the way you choose it to be. 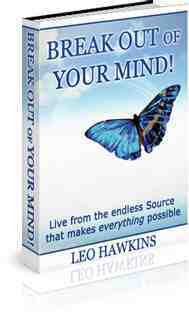 This book shows you a simple, systematic process of effecting a shift of consciousness from thinking you know who you are to feeling who you truly are. In an easily readable style, Leo introduces an updated form of the ancient wisdom teaching known as Self-inquiry. The simple process of Self-inquiry will bring about a shift of consciousness from thinkingyou know who and what you are, to the feelingof being who and what you truly are. Through the simple practice of Self-inquiry – which you will learn in this book – the power of awareness will dissipate the thought clouds that have veiled the truth of who and what you really are. When approached in the effortless way described in this book, every situation in your life, every problem, every challenge – even physical and emotional pain – becomes a portal to the profound mental clarity, emotional freedom, and blissful peace that lives within us all – as this present moment. “Break Out of Your Mind! is an absolute gem. It articulates the timeless wisdom of non-dual spiritual teachings in a personal and accessible way that is deeply relevant to the challenges of everyday life.